Learn Aramaic: ISIS selling ancient Hebrew and Aramaic manuscripts online. ISIS selling ancient Hebrew and Aramaic manuscripts online. Having looted and pillaged ancient heritage sites across Iraq and Syria, Islamic State is now believed to be selling stolen artefacts on social media sites. Facebook has now taken down pages thought to be selling artefacts such as coins, statues and manuscripts written in both Hebrew and Aramaic. It is thought that the items have all come from Syria. 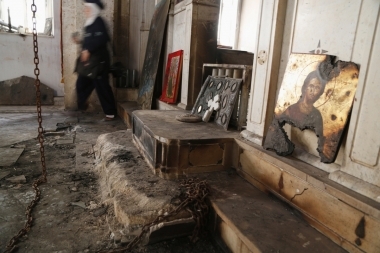 Islamic State militants have desecrated numerous churches, including this one in Maaloula, Syria. Washington DC-based journalist Zaid Benjamin was the first to highlight the issue, posting screenshots of the pages to Twitter on June 4. A privacy spokesman for Facebook told Fox News: "We may not always be able to identify artefacts as stolen, but insofar as we can when someone reports content to us, we will remove this content." ISIS militants have taken millions of pounds worth of artefacts from ancient buildings, including churches, across Iraq and Syria since the group began its uprising. A senior Iraqi intelligence official told the Guardian last year that jihadists had taken $36million, around £23million, from the al-Nabuk area – a mountainous region west of Damascus.